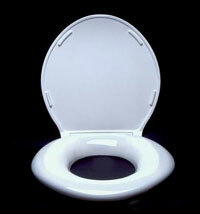 A man whose girlfriend sat on a toilet for so long that the seat adhered to her body will spend six months on probation. Kory McFarren pleaded no contest last month to a misdemeanor count of mistreatment of a dependent adult. A judge sentenced him Tuesday to six months in jail but granted the probation after the victim, Pam Babcock, asked for leniency. "She didn't believe that her circumstances were his fault," Ness County Attorney Craig Crosswhite said. Babcock's plight became known in February when McFarren called the Ness County sheriff, expressing concern about his live-in girlfriend. When authorities arrived, they found Babcock physically stuck to the toilet. McFarren told police Babcock had refused to come out of the bathroom for two years. Medical personnel estimated she had been sitting on the toilet for at least a month and said the seat had adhered to sores on her body. She is now under the protection of a guardian who was appointed through the legal department at the hospital where she received treatment. Also Tuesday, McFarren was sentenced to six months in jail for an unrelated charge of lewd and lascivious behavior for exposing himself to a teenage neighbor in March.